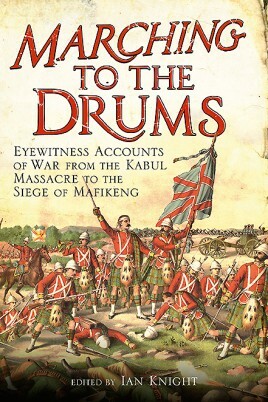 In this gripping collection of first-hand accounts, Ian Knight presents the adventure of nineteenth-century warfare – from the thrill of the cavalry charges at Balaklava and Omdurman, to the terror of battle against an overwhelming odds such as Rorke’s Drift – in the words of the men actually there. These eyewitness accounts provide a vivid and sometimes shocking insight into the brutal realities of warfare for the British imperial soldier, who fought against enemies from massed ranks of Russians and assegai-armed natives to sharp-shooting Boers, in often the most terrible conditions imaginable. These stirring tales of military adventure have been edited by Ian Knight and brought together and published in book form. Originally featured in turn-of-the-century magazine, popular during the heyday of empire, these historically valuable accounts throw considerable light on campaign conditions during Queen Victoria’s colonial wars. Marching to the Drums includes accounts focusing on the experience of battle during such pivotal conflicts as the Sikh Wars, the Crimean War, the Afghan Wars, the Anglo-Zulu War, and those in China, the Sudan and South Africa. Ian Knight is internationally acknowledged as the leading author on Zulu history and the Anglo-Zulu War.